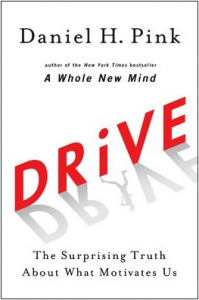 Daniel Pink’s Drive: The Surprising Truth About What Motivates Us is a great read for business leaders or any leader responsible for motivating and energizing people to be the best they can be. No longer is the carrot or the stick the appropriate means, rather, think back to Maslow’s self-actualization, the pinnacle place in the hierarchy of needs, the place where you want to be as a growing human being. Autonomy, mastery and purpose — Mr. Pink outlines several approaches to put these into action, so that people with whom you work or play will be at their best. Please let me know what you think. Thank you. I concur. I studied Maslow and I agree, self-actualization (the pinnacle of motivation) has been around a while. And it works! Nice to hear from you.